See waveforms being plotted in real-time. Depending on which device you have, you can plot data from different sensors on your phone such as pressure, acceleration, illuminance, and more! With your permission, your device's location allows us to map the infrasound field and localize sources. 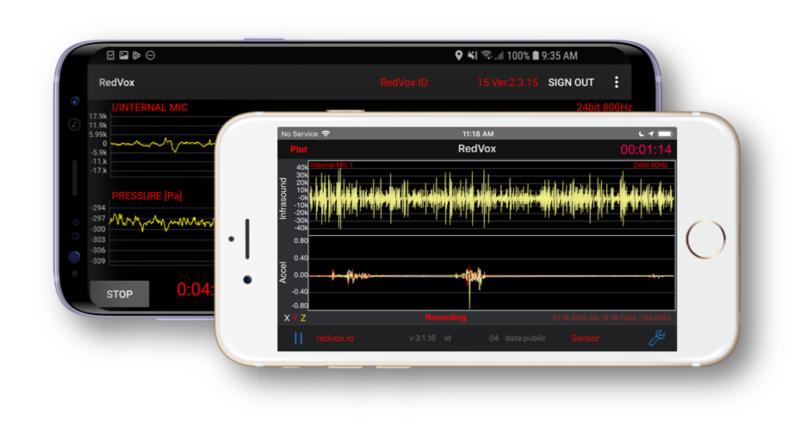 In the absence of cell or Wi-Fi, data packets will be saved to an allocated RedVox storage space on your device and be sent when communications are restored. The data packets will be stored in the cloud where you can access it at anytime. Array processing requires precise timing synchronization and sensor locations. With array processing, a location can be determined for a significant event. Learn about Time Synchronization with our manual.